Lemon meringue pie is one of America's favorite desserts. 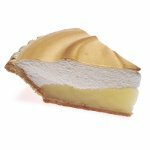 There even is National Lemon Meringue Pie Day celebrated each year on August 15. Lemon meringue pie is a type of baked pie which typically consists of three layers: a shortcrust or shortbread pastry crust, lemon flavored custard, and meringue. Unlike cherry pie and some other popular types of pie, lemon meringue pie does not have an upper crust. Fluffy meringue constitutes the pie's upper layer. Pies filled with lemon flavored custard have been enjoyed since Medieval times, but meringue is a relatively new type of dessert. It was invented and perfected around the 17th century. The combination of lemon custard and meringue started to be used in pies in the 19th century. The first recorded recipe of lemon meringue pie is attributed to Alexander Frehse, a baker from Suisse romande (French-speaking Switzerland). The lemon custard for the pie is typically made with egg yolks, sugar, starch, and lemon juice and zest. Its texture resembles that of a sturdy pudding. The meringue is made of well beaten egg whites and sugar and cooked on top of the custard filling. To celebrate National Lemon Meringue Pie day, indulge yourself with a slice of delicious pie which can be either bought from your local bakery or homemade.